Cuban Republic of God is a nation led by God Cuban Boi on the continent of North America. Cuban Republic of God's government is a Theocracy with very moderate social policies. Economically, Cuban Republic of God favors moderate policies. The official currency of Cuban Republic of God is the Dollar. 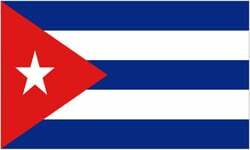 At 232 days old, Cuban Republic of God is an old nation. Cuban Republic of God has a population of 747,804 and a land area of 14,500.00 sq. miles. This gives it a national average population density of 51.57. Pollution in the nation is noticeable. The citizens' faith in the government is completely depleted with an approval rating of 0%. 04/20 08:10 pm - Cuban Republic of God had war declared by Republica de Guatemala for the reason of "Gib me all ur moneyz". 04/20 04:49 pm - Cuban Republic of God had war declared by SSI of the Hoplite for the reason of "Appear to be inactive.". 04/20 04:32 pm - Cuban Republic of God had war declared by Free Kazakhstan for the reason of "I will have vengeance.". 04/12 12:15 pm - Cuban Republic of God had war declared by Fortnum for the reason of "We have come to liberate you". 04/12 12:09 pm - Cuban Republic of God had war declared by Tsukuyomi infinito for the reason of "Hasta la vista, baby!". 04/12 10:22 am - Cuban Republic of God had war declared by Kaslandia for the reason of "I will have vengeance.". 04/10 02:17 pm - Tulles removed Cuban Republic of God from the alliance Camelot. 04/06 02:56 pm - Cuban Republic of God had war declared by Rebel Heaven for the reason of "Raid #498". 03/29 02:05 am - Cuban Republic of God had war declared by Peoples Republic of Britain for the reason of "For the revolution". 03/28 06:08 pm - Cuban Republic of God had war declared by sri lanka 001 for the reason of "You're a disease, and I'm the cure.". 03/28 03:00 am - Cuban Republic of God had war declared by Gardil for the reason of "DM for immeadiate peace.". 03/21 12:52 am - Cuban Republic of God had war declared by Ole Vonaire for the reason of "Arrgh!". 03/20 07:08 am - Cuban Republic of God had war declared by Pimitivo for the reason of "I will have vengeance.". 03/19 09:32 am - Cuban Republic of God had war declared by Old Brittannic for the reason of "You're a disease, and I'm the cure.". 02/12 11:13 pm - founded a new city, Cuidad de Dios 10.